We can all agree that puppies are the cutest creatures on the planet. There is nothing cosier than snuggling with a wriggly little cutie who is so full of curiosity. But it’s not so easy to take care of them on a full-time basis. Getting a puppy is almost as much work as having a baby — it needs to be fed, sleep trained and generally taken care of. In addition, your pup needs to be housetrained and I can guarantee that there will be more than a few accidents before that happens. It was the 18th May this year that dalmation Miley was due to become a mom for the first time. She and dad Astor eagerly awaited the arrival of their puppies. The vet that carried out Miley’s ultrasound said that there were three puppies. But owner Cecilia Langton-Bunkergot was in for a huge surprise when the puppies just kept coming. 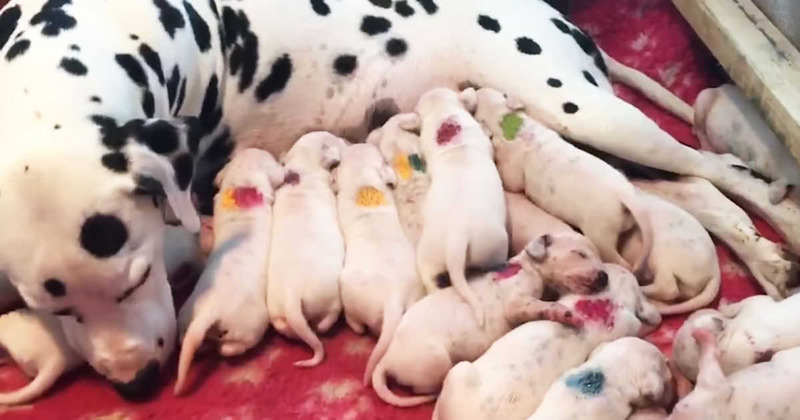 Miley gave birth to 16 puppies. But it didn’t stop there. 14 hours later, Another two small puppies appeared. The huge litter of 18 puppies became a record in Australia at the time the puppies were born. The litter has received alot of attention, including comparisons to the Movie 101 Dalmations, where Perdita gave birth to 15 puppies. There are 12 females and 6 males in the litter. All the puppies are healthy, microchipped and fully vaccinated. Make sure to share this article with all your Facebook friends, it’s impossible to not become “Puppy-broody” after seeing this! Published by Newsner. Please share.